I can rephrase this section heading as "I will wait until you die." That’s right. 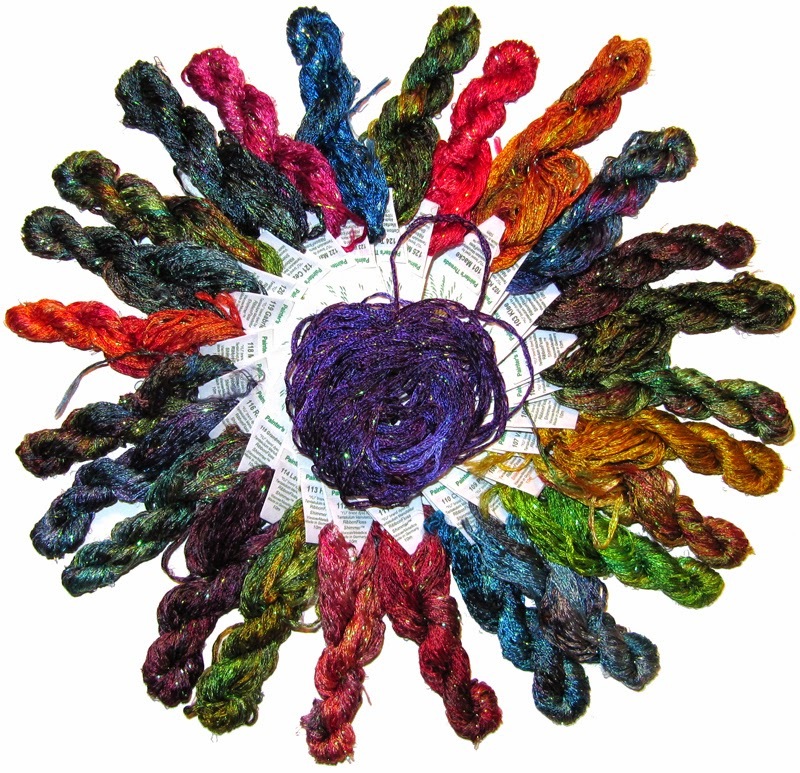 A thread can wait for another thread to die (or terminate). An example where you want to print a message on the standard output when the program has finished executing. The message to print is "Printing Done." In the main() method, a thread is created and started. The thread prints integers from 0 to 4. It sleeps for 3 second after printing an integer. In the end, the main() method prints a message. It seems that this program should print the numbers from 0 to 4, followed by your last message. However, if you look at the output, it is in the reverse order. What is wrong with this program? When the t1.start() method call returns, you have one more thread running in your program (thread t1) in addition to the main thread. The t1 thread is responsible for printing the integers from 0 to 4, whereas the main thread is responsible for printing the message "Printing Done." Since there are two threads responsible for two different tasks, it is not guaranteed which task will finish first. What is the solution? You must make your main thread wait on the thread t1 to terminate. This can be achieved by calling the t1.join() method inside the main() method. Following example using the t1.join() method call, before printing the final message. When the main thread executes the join() method call, it waits until the t1 thread is terminated. 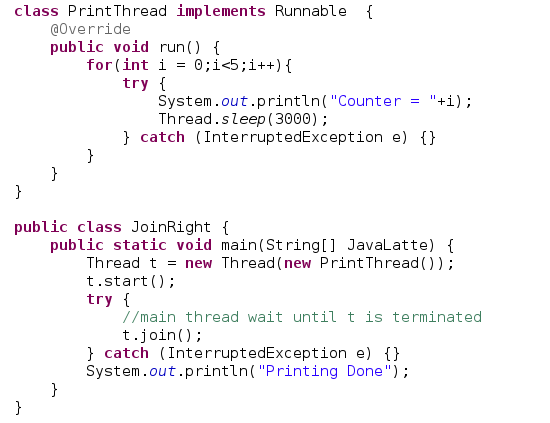 The join() method of the Thread class throws a java.lang.InterruptedException, and your code should be ready to handle it. In the first version of the join() method, instead of waiting indefinitely for the finalization of the thread called, the calling thread waits for the milliseconds specified as a parameter of the method. . When one of these two conditions is true, the join() method returns. The second version of the join() method is similar to the first one, but receives the number of milliseconds and the number of nanoseconds as parameters. You should call the join() method of a thread after it has been started. If you call the join() method on a thread that has not been started, it returns immediately. Similarly, if you invoke the join() method on a thread that is already terminated, it returns immediately. This example will explain the use where multiple thread call the join method. In this example, we simulate reading of configuration such as network and data source loading before starting out main application. 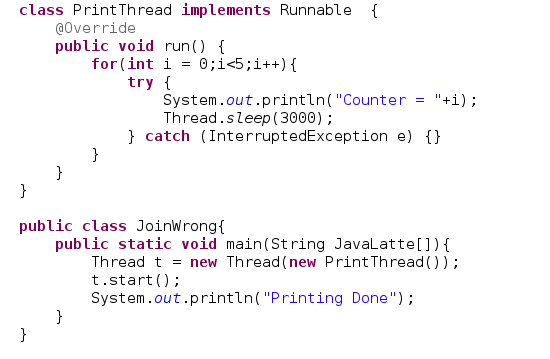 When you run this program, you can see how both Thread objects start their execution. First, the DataSourcesLoader thread finishes its execution. Then, the NetworkConnectionsLoader class finishes its execution and, at that moment, the main Thread object continues its execution and writes the final message.